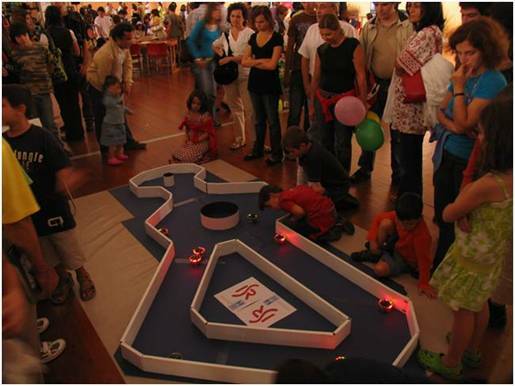 ISLab has been developing, together with the Mobile Robotics Lab, and under the Theme B of ISR – Associate Lab, field robotics activities and applications, motivated by their novel scientific and technical challenges (such as the cooperation among land and aerial robots, and among robots and humans, in unstructured, frequently outdoors, scenarios), relevance for public policies, and potential for innovative results on unstructured environments blending sound theory and technological developments. The work has been driven so far by applications to search and rescue, as well as urban, scenarios. 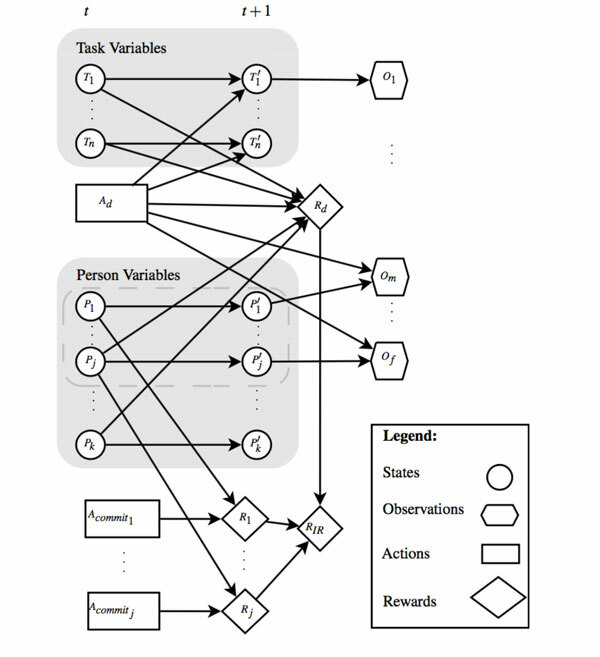 Initial work in field robotics comprised Search and Rescue (SAR) scenarios as a unifying testbed for diverse research approaches, ranging from the construction of new platforms, up to high-level coordination of mixed initiative human/robot teams. This sections enumerates these activities in a chronological sequence. This project aimed at endowing a team of outdoors robots with cooperative navigation capabilities, so as to demonstrate the ability of the robots to act individually and cooperatively in search and rescue-like operation scenarios. Search and Rescue (SAR) operations are a challenging application for Robotics since, due to their nature, they naturally foster advances in Artificial Vision, Navigation in outdoors unstructured environments, Distributed Artificial Intelligence and Intelligent Control. The long-term objectives of the project consist of applications to SAR under large-scale catastrophe scenarios, namely after an earthquake. 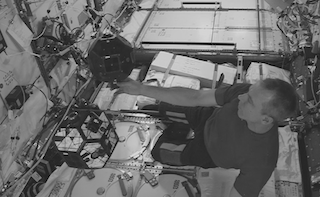 However, the project was focused on the first steps towards the long-term goal and, as such, it referred to simpler scenarios and was based on some simplifying hypotheses, such as daylight operation and pre-planned robotic tasks. Also, the robotic team included only 2 robots, purposively made heterogeneous, both regarding the functional, hardware and software architectures: one wheeled and one aerial robot. Therefore, each type of robot could be assigned tasks with different requirements under SAR operations. Definition of functional and software architectures suitable for the integration of the subsystems composing the robotic team, oriented towards SAR applications. 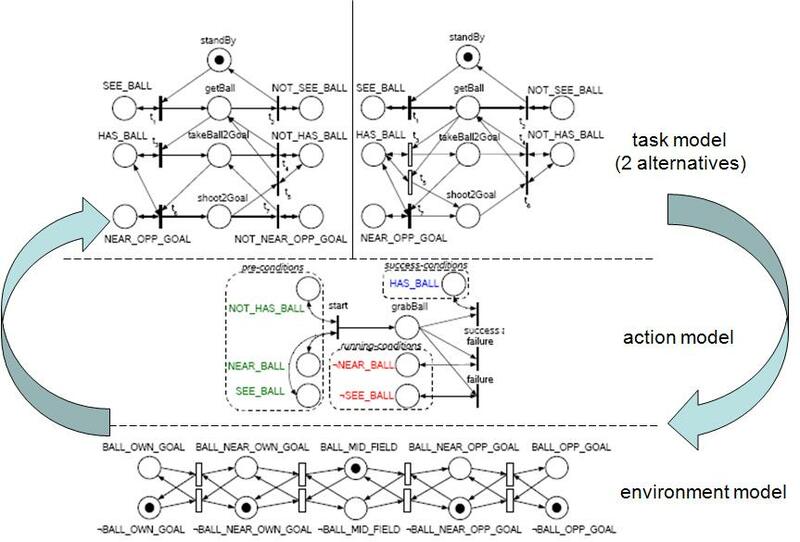 Issues concerning topological, world-model-based and sensor-based navigation within unstructured environments, as well as their extension to cooperative navigation, where 2 robots communicate with each other to share information relevant for team navigation improvement. This project was funded by the Fundação para a Ciência e a Tecnologia (FCT) under the contract SRI/32546/99-00, and involved ISR/IST VisLab as well. Aerial and land robots cooperating for Search & Rescue operations. In the context of the previously referred Rescue project, research on localization and map building using a land vehicle was carried out. In particular, SLAM techniques were used to build a topological map, as well as navigating along such a map. Topological maps differ from traditional metric maps in the fact that they represent topological relations among landmarks, rather than their exact coordinate position. Maps of urban subways are a classic example of such a map, as for traveling in a subway, the geographical relative positioning among stations is irrelevant. 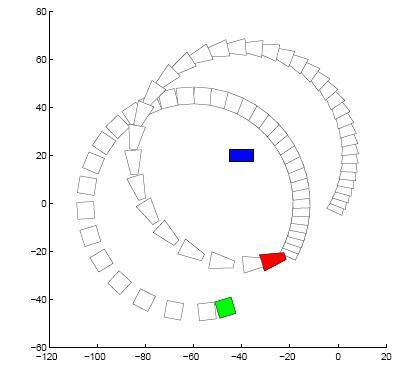 In the case of a SAR robot, cooperating with human teams, it is in general more efficient to communicate using landmark positions, instead of geographical coordinates. 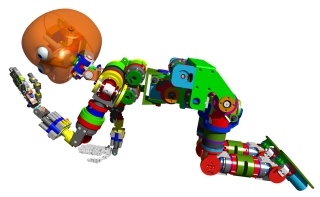 The RAPOSA robot is a tracked wheel robot build in cooperation with the Portuguese company IDMind, a ISR spinoff, together with the Lisbon firefighters corporation and the University of South Florida. This project comprised the design and construction of a tracked wheels robot, for the use in SAR operations. The input that the Lisbon firefighters provided was essential for the specification of the platform. This project was funded by the Agência da Inovação (AdI). immersive teleoperation using augmented reality on a Head Mounted Display (HMD) using the camera pairs to feed stereo video, and thus providing the operator with depth perception of the environment surrounding the robot; this was the topic of the research project AuReRo. 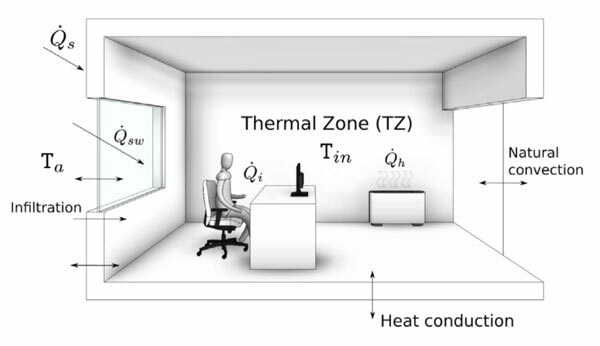 Current research proceeds on studying effective methods to improve the teleoperation immersiveness, namely exploring the development haptic interfaces. Aerial robots are capable of providing invaluable contribution for a cooperative team of robots, first because they can carry cameras and thus sending video stream captured from an altitude position, but also because they may be capable of mapping the terrain. These maps can then be used by land vehicles for navigation. 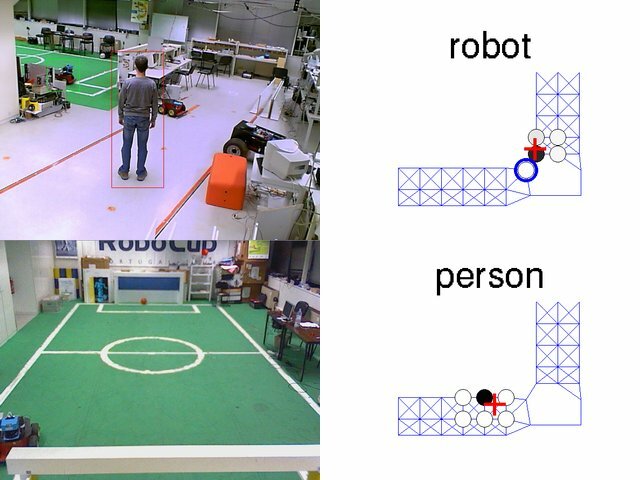 developing and testing vision-based algorithms for ground-lines following and object tracking (e.g., the ATRV-JR land robot) by the aerial blimp robot. The group is now shifting its focus from blimps to quadcopters, in straight collaboration with IST spinoff UAVision, namely through the co-supervision of several MSc theses and in the QREN project Quadmission. Quadcopters have the advantage of having larger mobility and resistance to winds. UAVision has also endowed their quadcopters with lower-level control layers that enable its higher-level control in a simplified manner, thus very adequate for the purpose of our research. Currently, we have MSc students working on formation control, cooperative object transportation, aerial SLAM and middleware for quadcopters.